PLANO, TX - (The Comedy News) Frito-Lay Inc. announced today that Speaker of the House John Boehner will become the newest spokesman for their snack food product, Cheetos. "Speaker Boehner is known recognizable as the most powerful orange person in the world," announced Frito-Lay marketing director Stanley Bridges. "Boehner's prominence, combined with that delicious crunchy cheesetastic taste of Cheetos will bring our products to many new markets." Chester Cheetah, the reigning spokesman for Cheetos, has been skeptical about his new tag-team marketing partner. 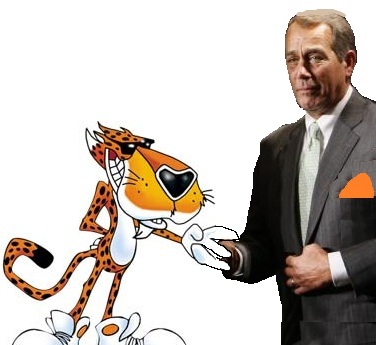 "Boehner has a lot to prove before he wins my respect as a Cheetos spokesman," explained Cheetah, after a staged photo-shoot with Boehner. "He's orange. I get it. He cries alot. Some see it as endearing. But he's also from Ohio. And I've seen his legislative tactics, they seldom produce results. That Boehner is dangerously cheesy." Speaker Boehner holds a residence in West Chester, Ohio. He is rumored to be taking up the nickname, "The West Chester Cheetah". However, the U.S. Patent and Trademark Office rejected his application due to his unabridged enthusiasm to shut down them and every other Federal Government entity.